This beautiful white jug cover with delicate real shell weights was made by my maternal great-grandmother, Mary Margaretta Davis. 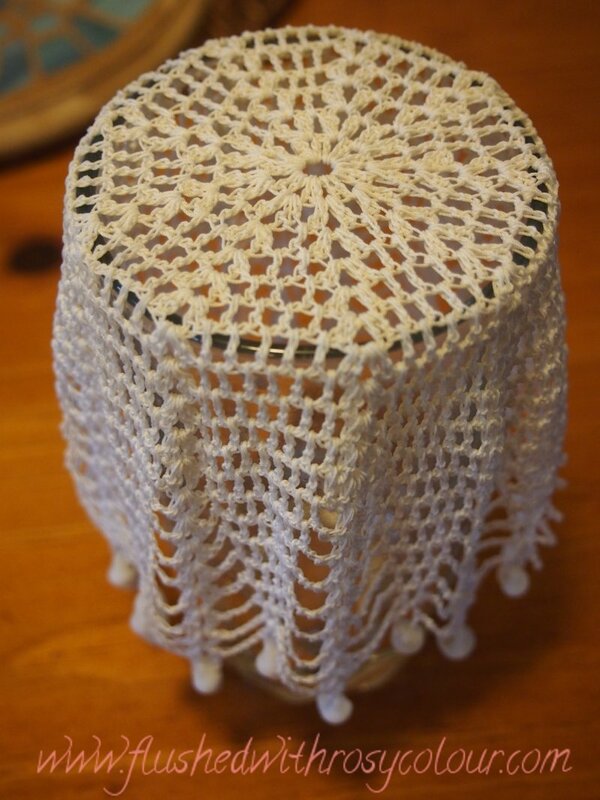 She is the great-mother that made all of the delicate crochet doilies, some of which I have already blogged about. My other maternal great-mother Elizabeth Jackson also could crochet, but she did more work with thicker yarns like baby jackets. I don't think I have any samples of her work, but she is my mother's grandmother who's parents owned a tailor shop. When my mother gave this to me a few weeks ago, it had an awful stain on it. Mum said I could try and wash it out with lemon juice. I did a search and found a site that recommended how to wash cotton in lemon juice so I gave it a try. The doily spent a couple of hours in the sun sitting on this glass and the stain has definately faded. I was worried it would deteriorate the cotton, but it doesn't seem to have and is still holding together strong. I hope one day to have the time to copy my great-grandmother's pattern. She has swirled it, instead of starting new rounds with chains. One of the many things that is on my list of things to do!